We love this picture so much that we just have to share it. 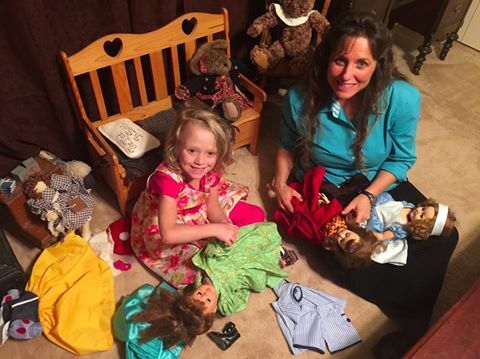 Michelle Duggar takes a break from the demands of a life with 19 children to play dolls with her youngest, six-and-a-half-year-old Josie Duggar. What are your favorite childhood memories of your mother? I am surprised Michelle was home long enough to play with any of her girls. She seems to be on the road more than at home. Also, have you noticed how she dotes on Josie? We see far more pictures of those two together than of Hannie or Jennie with their mother. I feel sorry for the middle girls. They might have the dress but not know the story. You seem to forget hoe close they came to loosing josie. How little she was when she was born. And the health problems josie has been thru. Seizures. Its not playing favourites or anything. I am very surprised to see a Snow White outfit in this picture. That story has all sorts of things that go against the Duggars' beliefs: An unmarried woman living with 7 men, a witch, spells and sorcery, attempted homicide, and an unmarried man and woman kissing before marriage. I'd like to know how they explain that story to their children, or why they would let them know about the story of Snow White, since it seems way too "worldly." I thought those books were forbidden? Any thoughts on this? First of all, I think you're reading way too much into the story of Snow White. While technically all those things you mentioned occur in the story, it is presented very innocently, especially the Disney version, and I doubt that any of that is the message that children will get from the story. When I was a child the main thing I remembered from fairy tales was "they lived happily ever after". Of course there is also the possibility that the Snow White costume is just a pretty dress for "dress up" play and has no connection to the story at all. Maybe they just got (or received) the doll without mentioning the story... I wouldn't be surprised if JB and Michelle didn't know the story either. Maybe you are reading too much into that doll's dress. I am just going keep it all simple and innocent the way it is to be. My mom was a good cook and she made good meals all the time but holidays were always glorious. Also she made fun barbecues and cook outs. Once we had a less involved Christmas morning and we each got a cheque on the Christmas tree. I ordered for myself from the Christmas catalogue and got a fashion doll in the mail, a Francie doll. One of her bendable knees broke, so she was lame in one leg. It was all innocent and no one has ever taught me the forbidden dark side of things like this. I wonder if it necessary to spoil a bit of family fun? Duh? All I see are some dolls, a little girl and her mom. And I don't think this should be exaggerated into a problem when realistically there isn't one and everything is fine. God has not given us a spirit of fear, but of love, peace and a sound mind. That is how I see it, for the sake of love, peace and a sound mind, rationally. These kinds of concerns are not voiced in front of the children you know that I hope. Settle your concerns aside and deal nicely with the children. Maybe some things do have to be taken away sometimes. Maybe sometimes the kids will have a reason to ask if a toy, etc is OK. Well from that perspective there are more functions to getting down on the floor and into the child's world. But it is always for the well being and best interests of the child of course. Fun times! I don't see the Snow White Outfit were is it in the picture. It's just the dress so maybe it came from the thrift store? Personally, I don't object to the story whether the Disney movie or traditional one but without the story it's just something cute for the doll to wear. Its possible that Josie doesn't even know its a Snow White outift/doll or the story behind it. Someone may have just given the doll to her as a gift. Even if she did know the story, its an innocent and harmless children's story. The seven dwarves were supposedly celebate and weren't known to form romantic relations. About the other factors, I doubt children even think too much of them. When I was younger, I never did. I agree that the dress doesn't seem appropriate, given their belief system, which they have explained to us over & over. Even if someone just gave the dress to Josie, Michelle & Jim Bob should be familiar enough with the story to realize its significance. It would be like giving them a Harry Potter costume, or something else inappropriate for them. "Snow White" is not a harmless story. Disney cleaned it up. The original Brothers Grimm version is very "grim" indeed, with two attempted murders of Snow White and death of the queen by torture at the end. "Thou shalt not kill." It's another example of things around the house not matching things we were told on the show. You would think someone in charge of their media would catch these continual mistakes. Perhaps they just buy them the dolls and don't know the story. There is NO Snow White doll in this picture. Period. 3 dolls-one dressed in a green dress, one dressed in a red dress, and one dressed in a blue and white dress. The white headband makes her seem like a nurse. UTTERLY RIDICULOUS some are, it's just a mama playing with her daughter.To speculate on anything you strangers think you know about their situations is just comical at best.To find fault in this here post is just another light shed on one's negative persona...And that sure is a pity😞Much needed blessings for sure! It is not ridiculous to question something in one of their own pictures that goes against what the Duggars have told us over & over & over! Where was this picture taken? That looks like no furniture in the Duggar house. I thought the girls' room had light-colored beds. That picture was taking in their playroom. I thought the playroom had a tile floor and not carpet? That looks like some upstairs bedroom, like Michelle's? It looks like they're in a bedroom, maybe Grandma's? There are what looks like bi-fold closet doors and a little antique stand of some sort in the background, like furniture a parent could have. In any case, Josie found a quiet place to spread dolls out, something that's probably hard to come by in the house. Or...wonder if this was taken at Josh & Ann's? Aren't they living in that big house with the pool where Jill & Derick stayed right before they left? Where some filming was done? Technically, she doesn't have 19 children anymore. So she doesn't have to take a break from all of them. Also, she says the older girls do most of the work, so it's probably not too hard to "find" this time. Not criticizing just digging for the truth. Sounds like criticism to me. And pretty mean spirited as well. Mother and daughter are having fun together. Why can't you just leave it at that? I don't want to criticize either but the quote "Michelle Duggar takes a break from the demands of a life with 19 children to play dolls with her youngest, six-and-a-half-year-old Josie Duggar" is quite excessive. Kind of ironic to the nay sayers here that Michelle has also got several grand children. We need to see JB playing trucks. considering that three of her children are married, one more is courting, and two are 26+ I think it is hard pressed to say she is taking a break from her 19 children ;P but nice to see her actually interacting with one of her kids. So to all of you saying that she doesn't technically care of 19 kids anymore, do you think it's an easy job to take care of, say, 13 or 14? Let me tell you, it's not! Even if you have tutors to help with the home schooling, and older ones helping with the chores, it's still a big job. Aren't there other things to criticize besides a mother taking a "break" and playing with her child? Yes, I agree with you, Sunnysideup. Just because the older kids don't live at home or do most of the work doesn't mean they don't turn to her for advice. They still go to her to find comfort and wisdom. She is still their mom and she does still have like sixteen kids at home. It's hard enough to just take care of ten (trust me, I know)! She still has the responsibility of being their mom. All of you who say you, "don't want to criticize" do you have nineteen kids and understand what it's like? Do you have sixteen kids at home? Do you have to run a Duggar-sized house? Think. I think it is lovely that Michelle is taking time to make Josie feel special. That is what family is all about,TIME. The spin of this seems to be that she is dealing with 19 children on a daily basis - so many of them are older now, it has been said that the older girls do the majority of the cooking, the children have "zones" that they clean, I would think there would be plenty of time to spend with the younger girls. She also has time that she used to spend filming. Just seems that the "spin" of the story is a little misleading. Very sweet picture. Michelle really is an exceptional mother. Not suggesting she is perfect, no one is, but after reading some of the other responses to this picture I was reminded that there are a lot of judgemental people out there who like to teardown this family. Indeed, some people seem to go out of their way to criticize and then attempt to rationalize their unkindness. It's too bad that a very nice, positive picture of a child playing with her mother should be met with such an assortment of unkind and rather petty remarks. As for the picture itself, I must say. Michelle looks great and Josie is a very pretty little girl. Wow has she grown! suprised to see her 1 on 1 with her child fiest pic like this i have ever seen!mary keim hambden twp ohio mom of many mennonite and loves the lord! The times my mom put her energy into were meal times. Also she had a job ad well as my Dad. Together they made us some wonderful holidays and birthdays. There were so many times we spent together, comes to mind she made some good barbecues and cook outs at the lake side picnic table cook sites, we swam while our parents watched over us and put on a cook out. Michelle and Josie having a precious time! Michelle constantly spends one on one time with Josie so that's nothing new. It would be nice to actually see her do that with Jordyn Jennifer or Johannah for a change. My mother, now 92, played "Hide the Thimble" with us. One person hid the thimble while the others were out of the room. The only rule was the thimble could not be placed inside or behind something. We got such a thrill out of finding it and would play this for hours. Whoever found it got to hide it. Funny, I had to teach my own kids about what a thimble was and what it was used for. They enjoyed the game, too. Thank you Michelle for sharing the photo. It lifted my spirits to see it. I LOVE that picture! So sweet and adorable! Michelle, you are an inspiration & Godly example to me often even though I am far from being a Mom like you or even where I want to be. Your unselfishness and compassion is so clear and comes out in all you do and say! We are not going to be given an account of every minute of her day. She makes it her purpose to spend time with all her children. She can play dolls in another room besides the girls bedroom. If the title had said, "...16 children...", people would be like "What happened to the other 3? Don't they count!?" This is just a cute pic of a mom playing with her youngest. That's it. No need to dissect it. I was only a half year older than Josie is now when I lost my Mom from cancer. So live up those precious moments Josie while you can. I hope you will remember moments like these as you grow older. It's been nearly 20 years now but I'd give anything to have my Mom back. So sorry to hear that. God bless you.